Is Your Android Phone Spying on You? 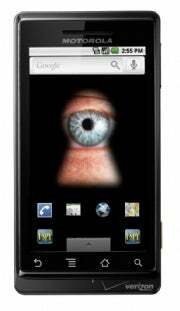 Worried your Android apps are spying on you? You should be, according to a recent study that found several popular Android Apps regularly share your location and critical phone data such as your phone number with advertisers and others. Researchers from Intel Labs, Penn State, and Duke University randomly selected 30 out of 358 popular apps from the Android Market for this study. The computer scientists were able to track each application's behavior using a special monitoring program called TaintDroid developed by the researchers. The researchers did not name which specific apps were behaving irregularly. You can read the entire paper about Android app security here (PDF) and you can find out more about TaintDroid here. While those findings may sound scary, the good news is I've got 7 tips for you to keep prying eyes off your Android smartphone or your iPhone. You can find a list of what your apps are doing by visiting the Android Market via your mobile device. Go to menu>downloads to see a list of the apps you've downloaded. Then select the app you want to check up on and go to menu>security. This will give you a list of all the information on your device that your application can access. This won't tell you what those apps are doing with that information, but at least you can get rid of any applications that want access to information you're not comfortable sharing with it. Note that some of Android's sharing and permissions information is a little hard to understand. Many apps, for example, say they have "full Internet access," but the Market doesn't explain what that means. Android's developer documentation isn't much help either, but it appears "full Internet access" means an app has unfettered access to send and receive data. If you're an iPhone user, you don't have the same wide array of permissions you can access through your phone. You can, however, check to see which of your apps are using location information. On your phone navigate to Settings>General>Location Services. This will show you a list of all the apps on your phone that use location information, and ones that have accessed your location in the past 24 hours are marked with an arrow. You can also deny any application access to your location information from this list. just the first few comments at the top. IPhone users are unlikely to find complaints about malware or other dirty deeds in the comments. Nevertheless, comments are still an important source to find out what others think about the quality of a particular app. Just as important as checking comments is to share your own thoughts about apps you've used. If you've been scammed by a peculiar app, make sure you share your horror story with others. Developers of fishy applications will (more often than not) have fishy Websites for their apps. It's a simple rule of thumb, and it can often save you time and heartache. Watch out for Websites that are poorly constructed, haven't been updated in a while or don't contain any valid contact information. Apple recently pulled apps built by Vietnam-based iPhone developer Thuat Nguyen for "violating the developer Program License Agreement, including fraudulent purchase patterns." Nguyen reportedly bilked iPhone users out of hundreds of dollars. Users could've saved themselves a lot of trouble if they'd merely checked Nguyen's Website, which redirected to a parked domain called home.com. A clear red flag. Whenever an application wants to update be sure to check what the changes are to see if it's asking for anything new. IPhone users can do this by tapping on the apps that have updates available in the iPhone's onboard App Store application. Android users should read over the new permissions list that appears before you install the update to make sure it isn't asking for new permissions you don't want it to have. Right now TaintDroid is a monitoring tool that requires you to modify your firmware to work. It is not an installable application right now, so TaintDroid is not ready for everyday users. However, the creators of TaintDroid plan to turn the program into an open source project. In a few months, maybe some enterprising developer will be able to create a usable TaintDroid application. Rumor has it that Amazon is working on its own curated Android app market similar to Apple's App Store. Details are unclear about which devices will be able to use the market. But it's worth keeping an eye on as Amazon may be able to effectively neutralize many, but not all, bad actors before they reach the online retailer's rumored Android market. Remember that while these tips will help maintain your privacy and security you take an inherent leap of faith with every app you download. The hope is that developers won't abuse your trust, and that safeguards such as community policing (Android) and quality control monitoring (iPhone) will keep out rogue developers. But there's always a small chance you could end up using an app that violates your privacy or has some rogue functionality built-in. The good news is that tools such as TaintDroid and Lookout Mobile Security's App Genome project are working to expose applications that are behaving badly.